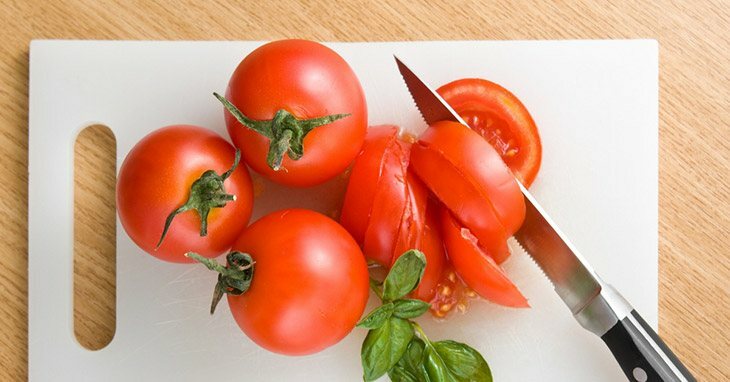 →How To Find The Best Chopping Board For Your Kitchen? 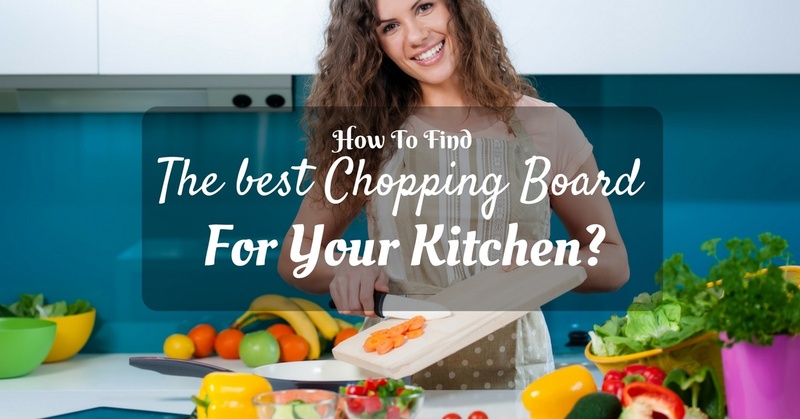 How To Find The Best Chopping Board For Your Kitchen? As a person in charge of the kitchen for the mean time, you may need some materials that you may call your own and that of which can be considered as of your own preference. You already have everything you need, except for the best chopping board which is too important since you do not ever want to cause a scratch on you counter top. You may not believe it, but this article will help you get the Best Chopping Boards ever! Chopping boards are created to protect your grandiose count﻿﻿e﻿﻿rtop from the possible scratches that may be a result from the sharp pointed edge of your knife when slicing. They protect the edges of the knives as well from the possible danger of it being blunt as it is before using. Chopping boards can be utilized to easily move the sliced or cut ingredients to a cooking pot, promoting a cleaner kitchen, since most of tiny bits and pieces of the cut ingredient are kept in one neat place for easy clean up after the food preparation. Further, these are also capable of being cleaned and sanitized for future use. There are different kinds of chopping boards available for your meticulous preference; the most renowned ones are those that belong to three groups, plastic, wood, and bamboo. Plastic chopping boards have the advantages of being lightweight, affordable, and it doesn’t have many possibilities to be stained or to cause to stain. However, the downsides to using plastics are that they are vulnerable to cuts on the surfaces, especially if your knife is too sharp for slicing your food parcel, and it might also cause your knife﻿ to reduce its edge's sharpness. The thing about it being easily scratched up is that it can accumulate bacteria more easily and when you use it for slicing food, you contaminate the people who eat your food to such bacteria, which is totally horrifying. Plastics also are known for being the least preferred type of chopping board. Although a lot of people have their claims of such chopping boards to be completely sanitary, even by just cleaning them up in the dishwashe﻿﻿r. Actually, there has been already a study about its vulnerability from bacteria. 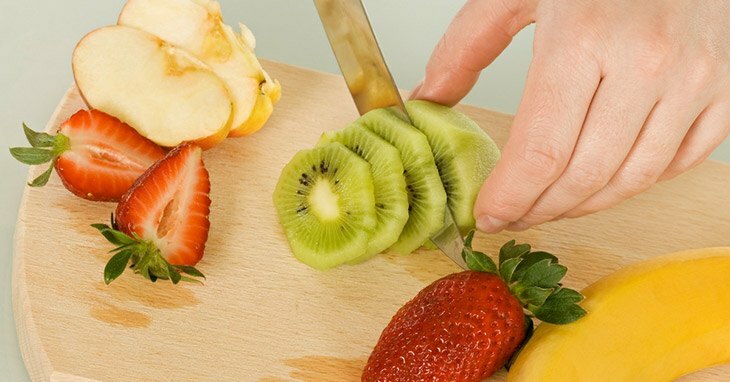 The same study has found out that even if plastic chopping boards claim to be capable of being sanitized, its plastic surface, which has been scratched by a sharp edge of the knife has no possibility of getting cleaned up for sterilization. Furthermore, it should also be of your knowledge that if a plastic chopping board is damaged by the knife, then there is a prospect of having some small particles of plastic to be mixed up with the food. Horrible! The chopping boards that are made of wood can be said to be really friendly to that of the sharp edges of your knife. It possesses a penetrable structure that can kill any bacteria that may have accumulated on the surface by only getting rid of the moisture that can be observed in its exterior. However, wood chopping boards may need some kind of a greater upkeep than that of the previous kind. It also cannot last long if it is exposed in a dishwasher; much more so when it happens to be soaked in water. They can also be some kind of a hassle as they have greater weight and are more costly than that of a plastic chopping board. Wood chopping boards are once criticized for being porous since it was believed that it accumulates more bacteria that can definitely contaminate the food being prepared. However, this has been denied after a study has been done on woods, showing results that its fibers do actually self-heal. Such activity lessens the hollow on the surface of the wood wherein bacteria are believed to penetrate. 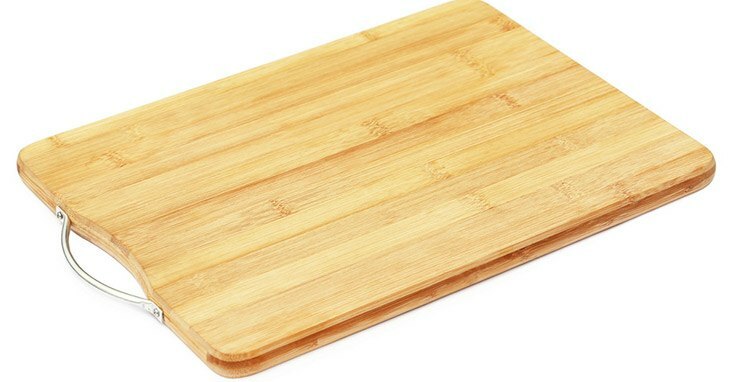 This kind of chopping board is being sold and labeled as 'eco-friendly', which is due to the material that is capable of growing fast and of it being biodegradable. This also cannot be cut or scratched by a sharp-edged knife since this material is already proven hard enough that it causes the knife to be blunt when attempting a scratch on it. The hardness of the material is also said to be a complement for sanitation. 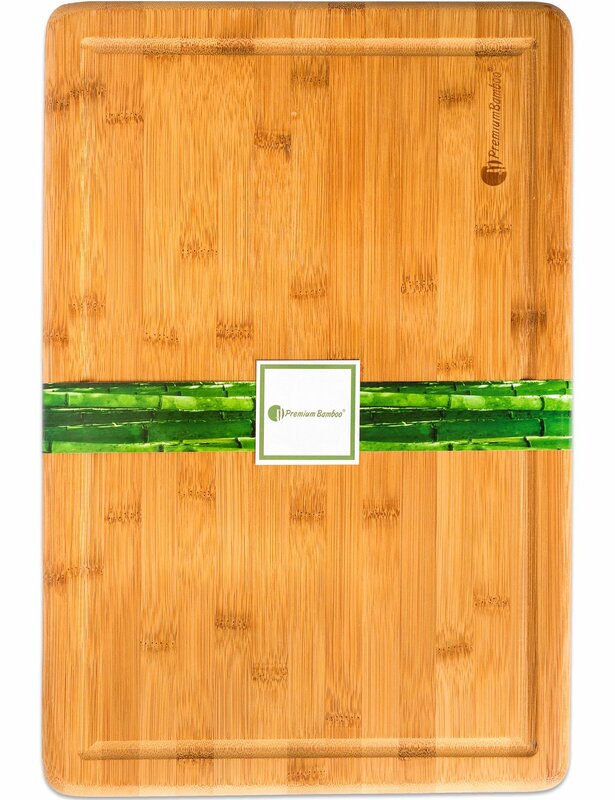 However, some manufacturers discourage people like you to use bambo﻿﻿o chopping boards. This is due to the fact that the board's tough characteristics mentioned a while ago, cause the knife's blade to break or sway in an awkward manner as the latter may not be sturdy enough. Having known the above information, you might feel like you can go on your own already and choose the product of your preference. However, there is something else that you still need to learn. Before rushing out to buy your ideal chopping board, pay attention to the following characteristics as they are, more often than not, the ones that you should be looking for in a product to consider its quality as well as its performance. The size of your chopping board is of vital importance. The small one can be very efficient in cleaning or cutting small items swiftly. However, we might as well assume that every kitchen needs a large chopping board. This is for the unprecedented scenarios in which, for example, a large meat may be delivered to your kitc﻿﻿he﻿﻿n and you have to deal with it; smaller chopping boards wouldn’t be of much help. Nevertheless, the question of how large it should be will be heard also. You might want to consider a chopping board as large as your sink, or just as much as the chopping board could fit into the sink. It should be of primary consideration that anything should be washed first before a session with a knife and a chopping board. The chopping board itself as well needs to be washed, it would be such a hassle if it cannot fit into the kitchen sink, it might cause a mess on your floor if it's too large that you can't even handle it well. In addition, the benefit of it being large is that you would have ample space while doing your thing, as such, your posture wouldn’t be compromised since you do not have to fit everything to the chopping board while slicing. A large chopping board would be of many conveniences to you. The thickness of your chopping board should also be considered. It must depend on your height and that of your kitchen counter. There is a tendency of having muscle aches if you pick the one you are not comfortable with using. Therefore, you should choose the one that has the dimensions that give you comfort. Since the wood type of chopping board appears to be offering a great advantage and least disadvantage, you might want to stick with it. Be warned though that the surface of the wood chopping board can be damaged when using it. 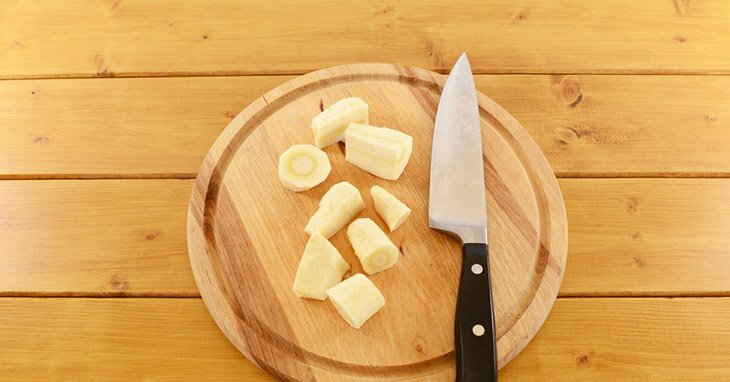 Your sharp-edged knife might cut right through it without meaning to, thus causing your chopping board to look worn. However, this can be fixed by oiling the wood at once every couple of weeks to maintain its quality and for its maintenance. These are usually carved out at the edge of the chopping board to contain the juices that may be extracted from the items being sliced. For cleanliness and order, it is recommended that you use different chopping board for carving and serving, and another one for slicing and chopping as a preparation for the ingredients to be cooked. Given these and more, the following are the Best Chopping Boards ever, that you wouldn't even seem to believe it yourself. 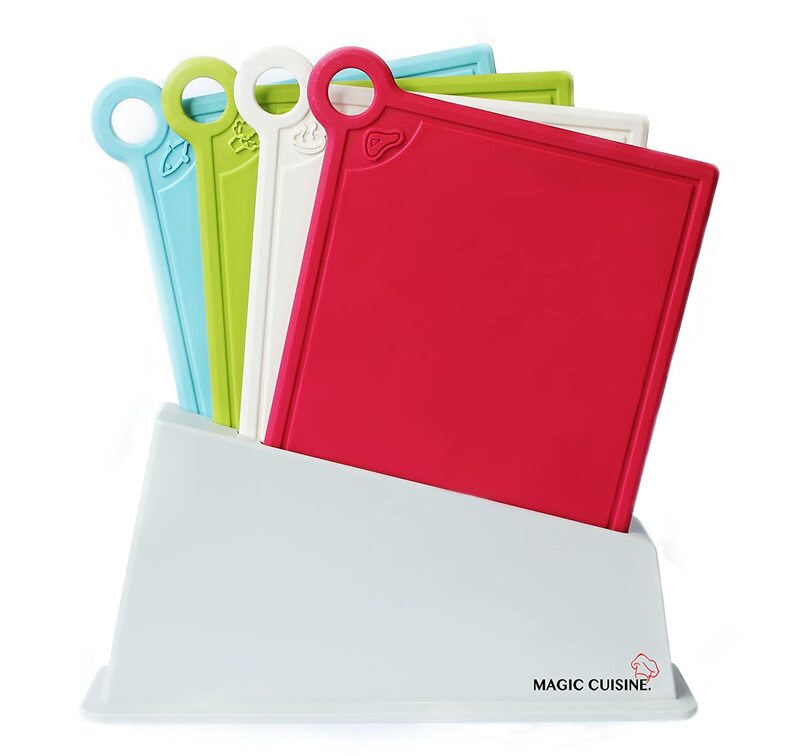 It offers four high-quality cutting boards; it is capable of painting pleasing colors and associated food icons. For the product's protective features, a micro band is included, which is a security that inhibits the development of stain and odor-causing bacteria for the safety of your food. It has the perfect size that would truly fit into your standards, it is color and icon coded, and it can be cleaned with ease. However, it doesn't have a rubber feet that is important in order for the product to remain in one place even when in use. ​Its product dimensions are 13 x 4 x 8.5 inches with an item weight of 3.4 lb. 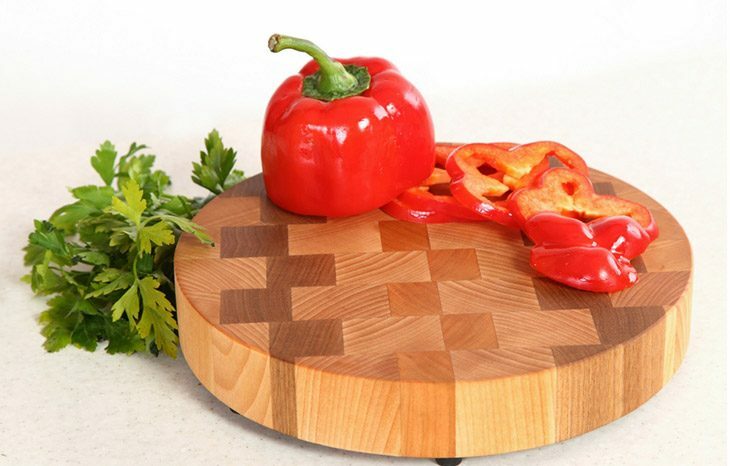 It has also been approved by FDA as well as by the BPA; meaning, the foods prepared by these chopping boards are safe. For cleaning this product, you don’t have to scrub it up too hard. Its product dimensions are 11.7 x 8.5 x 0.1 inches with an item weight of 1.5 lb. This is a set of four high-quality chopping boards. This product includes a micro ban protection, which is a defense that is built-in that inhibits the development and the bacteria. This product is made of plastic but it is of premium quality and is durable. 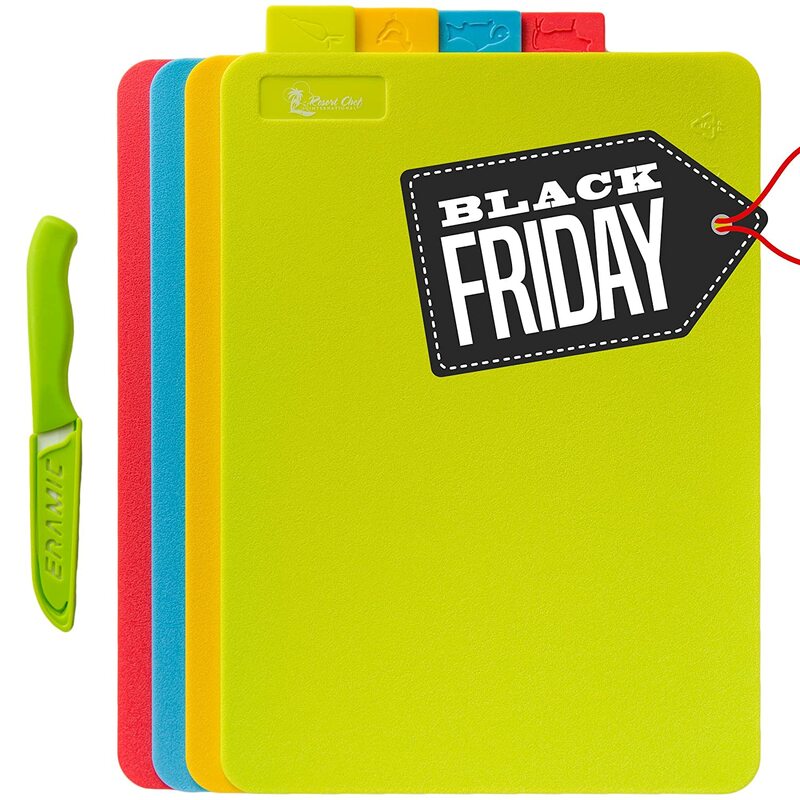 This is a 3-set chopping board which can be used perfectly for slicing meat, vegetables, bread, and others. ​The three chopping boards which make this product vary in sizes; small 10x5.75 inches, medium 12.5x7.75 inches, and large 15.5x9.5 inches. All three also have a grooved side to contain the juices that may be extracted from slicing the different items. ​They have a highly functional non-slip feet made of rubber that is positioned near the handles, and at the bottom of the chopping board to make it safer to use on your counter top. ​This product gives the consumers a peace of mind by establishing a 90-day money back guarantee. In general (the large board considered), this products dimensions are 15.5x9.5x0.9 inches, with an item weight of 3.1 lb. Its manufacturer is Chef's INSPIRATIONS. 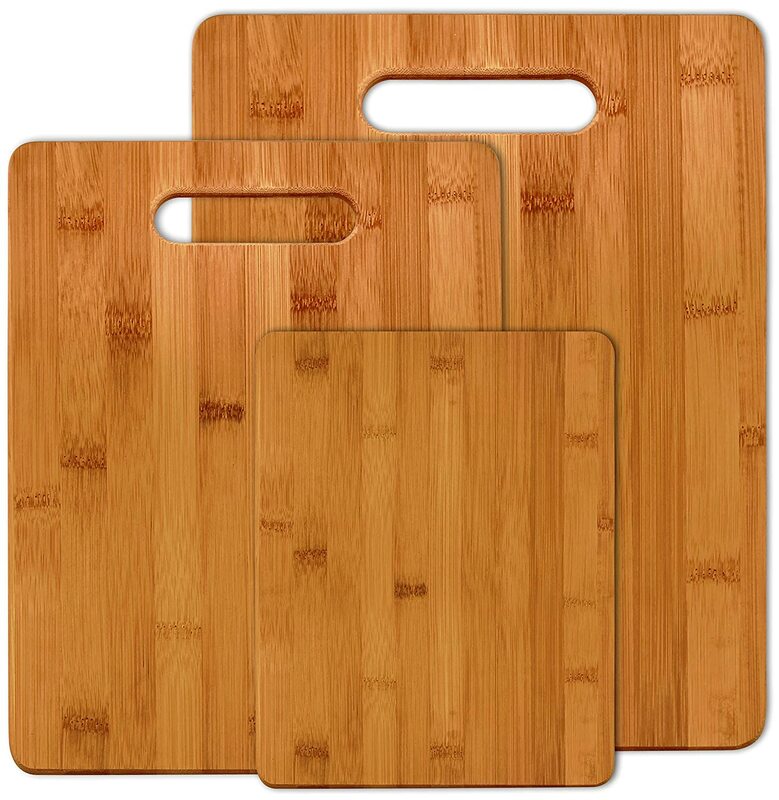 This is a set of three chopping boards which vary in sizes and dimensions. Small is 7.8x5.9 inches, the medium is 11x8.6 inches, and large is 13x9.5 inches, and all of these have 0.6 inches of thickness. These are sized to accommodate all kinds of cutting tasks. 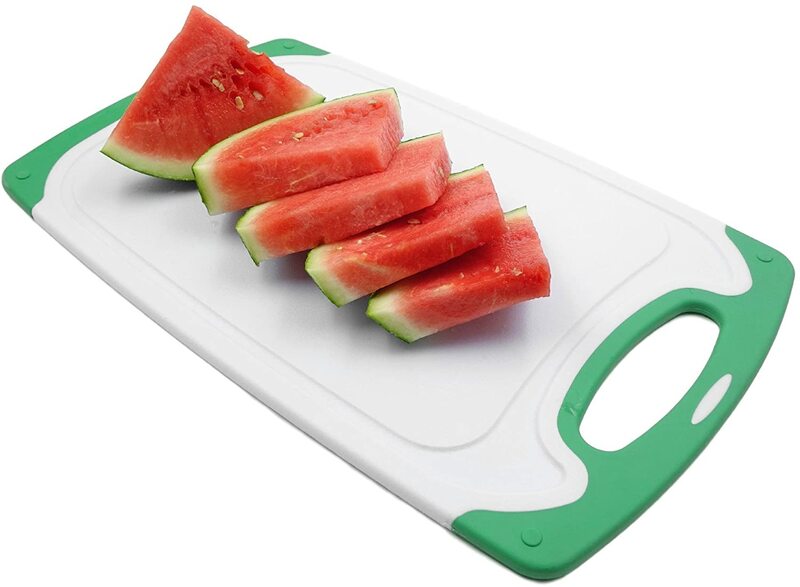 This is a large chopping board which includes a drip groove that contains the juices from the sliced items. 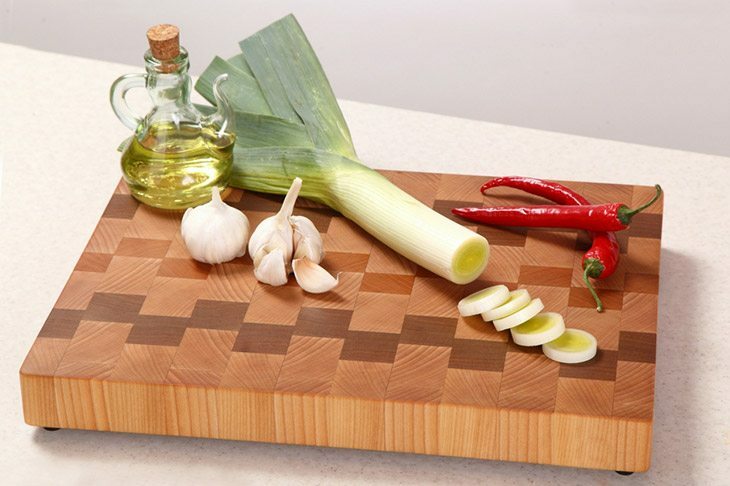 This chopping board is known to be sturdy and long-lasting. This proves also to have an ease of cleaning and maintenance. The dimensions for this product are 18x12x0.8 inches with an item weight of 1 lb, which is great for chopping large meat. Aside from it not having a con, you would see how much it differs from that of the other products presented​​Well as to its pros, it doesn’t differ much, in fact, they have almost the same characteristics that it would seem like this product is a combination of all the pros of the other ones. ​However, in the cons section, though, other products have been criticized for not being able to be easily cleaned, rubber feet not sufficient to hold the board, and the like. ​​These have all been enhanced in this product, and that these concerns are addressed to for an improved safety and quality performance. ​​Further, it would seem that it is the perfect one for you. 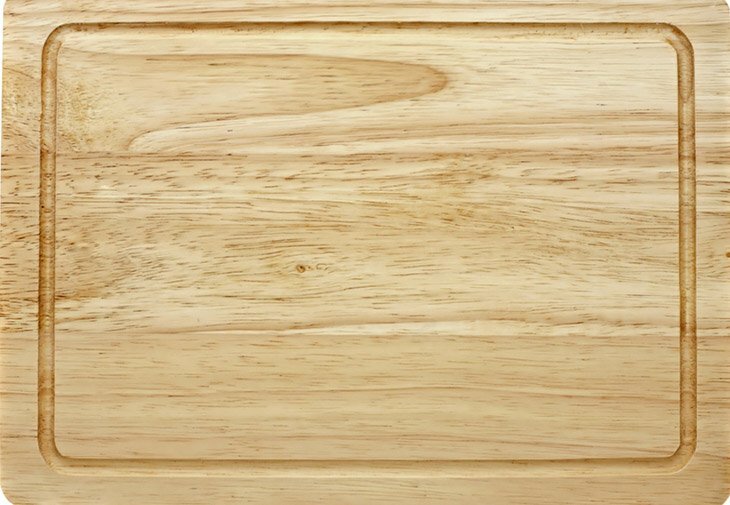 To tie it up to the stated attributes of a chopping board above, the size, surface, and the grooves should be considered. In this product, it is large enough and I think it fits the qualification given earlier. ​​As to its surface, it cannot be easily penetrated by a sharp-edged knife because a chopping board made of bamboo has a sturdy surface that, when a knife attempts to establish a scratch to its surface, the former would be the one damaged.